Chekhov's The Seagull is a classic of the theater, but I had never seen it. That's not exactly true, it was actually the first play I ever saw at the Guthrie, but being almost 25 years ago, I have no recollection of it. 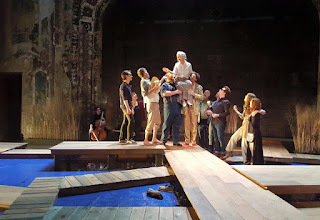 So it was as if I'd never seen it when I sat down to yesterday's matinee production of The Seagull by Theatre Novi Most, a company that specializes in Eastern European theater, as part of the Southern Theater's ARTShare* program. It took me a few minutes to get into this story of many inter-related characters with strange sounding names, but by intermission I was completely under its spell. This is one of those shows that is so completely captivating that it's hard to shake when you leave the theater. Funny, tragic, odd, and completely enchanting. The main events of the play occur one summer in the country by a lake. Irina, a successful actress in Moscow, and Trigorin, her writer lover, go out to the lake for a bit of relaxation. Irina's son Konstantin is also a writer. He talks about creating new forms of art, but all he wants is for his successful mother to love him and approve of his work, which of course she never does. His girlfriend Nina falls in love with Trigorin and follows him to Moscow to pursue her dreams of becoming a famous actress like Irina. It doesn't go well for her. Like Konstantine thoughtlessly shooting a seagull, Trigorin "comes along and destroys her life, because he has nothing better to do." Several other characters in the country town struggle to find love, an unhappy wife and a charming doctor, a young woman in love with someone in love with another. But despite all the tragedy, there is music and beauty. The 1997 adaptation by Paul Schmidt uses fresh and modern sounding language. This doesn't feel like a stuffy old story from another time and place, but one that could be happening here and now. The modern yet classic casual costumes by Jeni O'Malley add to that feeling. The production makes wonderful use of the gorgeous shabby chic space at the Southern. Wooden walkways, like docks, are built in a maze across the floor of the main stage space. Moving images of a lake and horizon are projected onto the uneven brick back wall of the theater, ever changing and as hypnotizing as watching a real lake is, colors slowly transforming from sunset to moonlight to daytime. On the sides of the arch are vague forms of green trees, or the moon with clouds floating across it. The overall effect of the images against the bones of this faded beauty of a theater is quite lovely, subtle, and evocative. 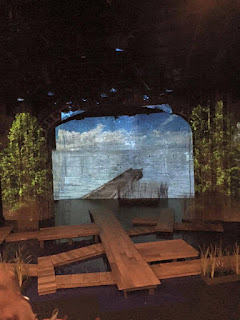 The story may take place far away in Russia, but we Minnesotans are familiar with the lure of the lake, beautifully represented in all elements of production (set design by Michael Burden, lighting/projection design by Ian Knodel). Director Vladimir Rovinsky has created a dreamlike quality in the storytelling, in fact the play is bookended in a way that makes one think it was all a dream, or a distant but very real memory. Fluid movements are repeated, characters appear and disappear as if a vision, to haunting effect. A cellist (Bree Schmidt) provides not must musical accompaniment but a sonic backdrop for the story. Characters occasionally join in the music on guitar, banjo, or trumpet, sometimes singing rousing Russion folk songs. The large cast does a wonderful job of bringing these varied characters and stories to life. Fresh off her haunting portrayal of Miss Havisham in Park Square Theatre's new adaptation of Great Expectations, Barbra Berlovitz creates another complex and fascinating woman as she effectively navigates Irina's mood swings from loving mother to harsh critic. As her son Konstantin, Nathan Christopher brings raw humanity to the young tortured artist. Shelby Richardson's Nina believably transforms from the bright and hopeful young actress to a woman damaged by life and men. Other highlights include Pearce Bunting as the charming rogue of a doctor, Terry Hempleman as the lovable uncle, Paul de Cordova as the callous Trigorin, Julianna Drajko as the victim of unrequited love, and Kimberly Richardson in a comic/tragic performance as an unhappy wife. The Russian half of the Artistic Directing team (Vladimir Rovinsky) explains Chekhovian characters to the American half of the Artistic Directing team (Lisa Channer) thusly: "They are trying each day to kill the serf in themselves, trying to be a little bit freer, yet knowing this will never really happen. But still they try and in that futile trying, there is humor and pathos. All Russions understand this. It's not at all like resilient Amercican hope." 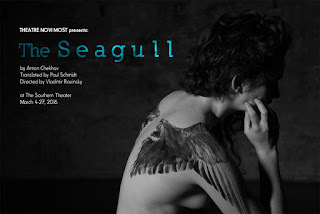 With the odd and enchanting little dream that is this production of The Seagull, Theatre Novi Most has perfectly captured that feeling. 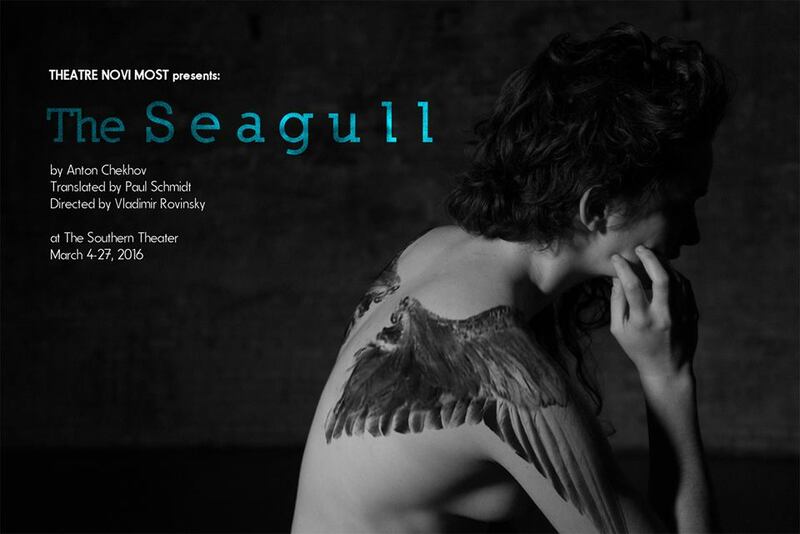 The Seagull continues at the Southern Theater in rep with other ARTshare productions through March 27. *Through the Southern Theater's unique ARTshare program, for $18 per month you can see as many shows as you like from a large collection of diverse theater and dance companies. See their website for more information.